Kerala Polytechnic Diploma Trial Allotment 2018 Result : Polytechnic Provisional Rank list & Trial Allotment will be published on 25/06/2018. The candidate can check their Trial Allotment from web site to get an idea about the chances of getting allotment to a programme and college based on options exercised along with the application form and the rank of the candidate. Inclusion in Trial allotment list does not guarantee that the candidate will get an allotment in a Polytechnic College and programme. 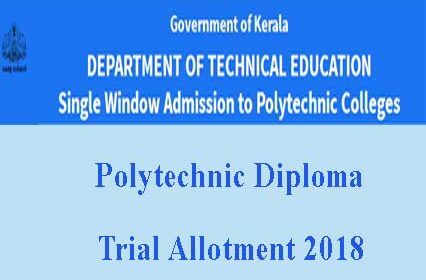 Kerala Polytechnic Trial Allotment 2018 published on Kerala DTE web site. The candidates who have applied for DTE Polytechnic Diploma courses can check their trial allotment result and the provisional rank list from this web site. The candidates can re-arrange the options by submit the application upto 28-06-2018 to the polytechnic college. Kerala Polytechnic Final Rank List & First Allotment Result 2018 : Polytechnic Final Rank List & First Allotment Result 2018 will be published on 2-07-2018 at www.polyadmission.org. Candidates can also verify their individual rank in the list through the link provided in the website using their Application Number and Registration Number. Along with the Publication of Provisional Rank list, First allotment will be done. Final Rank list and Allotment will be based on the Rank of the candidate & Options/Revised options received. The candidate has the facility to submit revised options if required, to the Principal of the Polytechnic College where the Original application is submitted in the Prescribed Form, within 3 Days after publication of the Trial Allotment, for necessary action. Revised options received thereafter will not be entertained. Last date for Appeal and Submitting Revised Options is 28-06-2018.